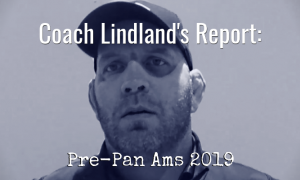 When the clock read somewhere around 7:15am EST and RaVaughn Perkins had just fallen to Edgaras Venckaitis from Lithuania, it was easy to chalk the previous night’s (or day’s, if you were in Mongolia) events as a disappointment. 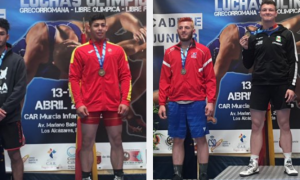 After all, the US group of Jesse Thielke (NYAC, 59 kg), Perkins (NYAC, 66 kg) and Joe Rau (Minnesota Storm, 98 kg) did not qualify their weights at the 1st OG Qualifier in Ulaanbaatar, meaning they will have to give it one last try in two weeks. 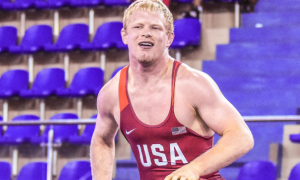 There is no doubt that what took place may have seemed like a letdown for fans of the US Greco team, a fanatical bunch who wanted to see the wrestlers get it done in the worst way. Thing is, focusing on perceived negatives doesn’t usually lead to success for anyone. It’s also a little short-sighted. Because there were certainly some positives to glean from each American competitor. If there is one thing yesterday showed, it is that Thielke can be so good, it almost looks easy for him out there. Now, it might never be “easy”, but the way Thielke turned it on at times provided a clear reminder of what he can do when he just wrestles. Case in point was his passivity call in the second period. 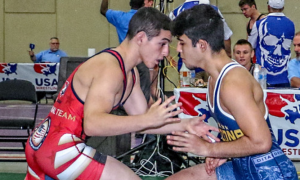 As soon as he was dinged, the NYAC wrestler gestured in a “it’s him, not me” kind of way and then proceeded to basically run Guarav Sharma (IND) off the mat for a step-off point. It was more than just a point scored: it was also Thielke’s way of showing that he was engaged and ready for war. Back-tracking a little, even Thielke’s first points of the match were reactionary and clean. Sharma reached up off Thielke’s lock attempt and paid the price immediately courtesy of a sweet modified slide-by. The reason why the sequences above are being showcased is because they demonstrate just what Thielke can do at different times when he’s out there having fun. It would be speculative to infer why he got caught by Sharma late in the match. Was he getting tight? Did he just want to get the first win out of the way? Who knows? It doesn’t matter now. What does is that Jesse Thielke was the better wrestler in that bout when he was out there just doing his thing. Perkins went 4-2 in a tough, tough bracket. If this was not an Olympic qualifier and just an in-season tournament overseas, he would have been hailed by all for bringing back a bronze. There’d be a write-up with a headline here and everywhere else with the image to go along with it. 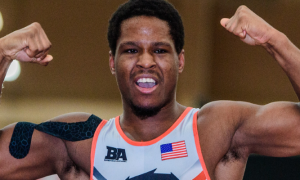 First and foremost, one thing needs to be cleared up: Perkins wanted it, and not only that, he displayed an absolutely impressive amount of poise in each match he wrestled. It’s not easy to wrangle Mirambek Ainagulov (KAZ). That dude is a firecracker. Perkins had zero trouble with him. Zero. 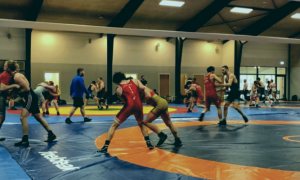 Pavel Liakh of Belarus, an experienced competitor who has wrestled on-and-off at the non-Olympic 71 kg, got a first-hand account of what Perkin’s rangy gutwrench feels like. Perkins had plenty of other moments throughout his day. 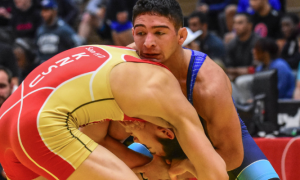 He wrestled an inspired tournament and came extremely close to getting the job done. He also likely learned a little about himself, lessons he will hopefully take with him to Istanbul. To be fair, Rau did not score a whole lot of points in his one match versus Carl Schoen (SWE). In fact, he only scored one, and that was after scrambling out from under a headlock. Carl Schoen had a big day, qualifying the weight in pretty crowded field. Normally, the Swede is a bit of a plodder, someone who hangs on and waits for par terre. The openings one who is familiar with Schoen’s style might have expected to be there weren’t. It happens. That doesn’t mean there weren’t encouraging signs for the Minnesota native. Rau might have had trouble setting up his offense, but one thing he did well was stay in the pocket with a very big, very strong 98 kg wrestler who tries to goad opponents into playing his game. Rau wouldn’t fall for it. Rather, he started off using his feet to push inside, a strategy that disrupted Schoen early on. For Rau’s point, which was the aforementioned escape from underneath a headlock, the notable detail was not in the scramble but in the transition. As soon as Rau found the position, he immediately locked high for a lift or high gutwrench. Neither were there, but the deftness in which Rau attempted the maneuver demonstrated just how agile and quick he can be in this weight class. He got there FAST. 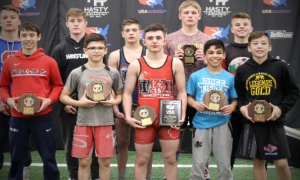 On another note, all three US Greco wrestlers were in excellent condition. Not a labored breath to be found. Perkins looked stronger as the day wore on. No one ever questions the Americans when it comes to strength and endurance, but it was evident that for each match, it was the US guy who was in better shape. All it takes now is regrouping and building on the positives as the trio gets ready for Turkey in two weeks. They do have it in them. They just need to put it together.